Take a good look, but don't expect to be able to buy one. You know that music technology has started to eat itself when you see a dedicated soft synth controller that looks exactly like the hardware that said synth emulates. 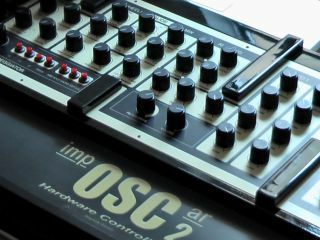 This is what greeted us when GForce Software visited the MusicRadar offices this week; the company recently commissioned Mario Jurisch to create a very special control surface for its forthcoming impOSCar 2 synth. This has been spotted in the hands of Underworld and, in the video above, GForce's Dave Spiers explains how and why it came into being (and, of course, gives you a demo). At a time when most off-the-shelf controllers are proudly open-ended (ie, they can be assigned to work with anything), this one is hard-wired to tweak one instrument and one instrument alone. One thing we should note is that this thing isn't going into production, so don't contact Mario or GForce asking to buy one. We hear that a keyboard version is being made, too, but don't expect to be able to buy that either.